Established in 1956, University of South Florida (USF) is a large, public, four-year university offering undergraduate, graduate, specialist, and doctoral level degrees across three, separately-accredited institutions: USF; USF St. Petersburg; and USF Sarasota-Manatee. Comprised of 14 colleges, USF serves over 50,000 students and counts with more than 16,000 faculty members. 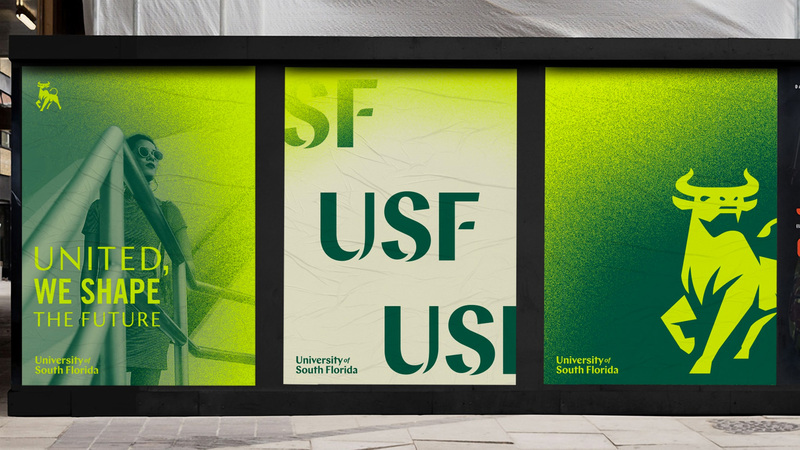 This month, USF announced a new identity that will be fully introduced by January fo 2019, designed by Tampa, FL-based Spark. This rebrand reflects the positive changes and notable progress happening throughout the university system. Achieving Preeminence, becoming home to a chapter of Phi Beta Kappa, and beginning the process to unify USF’s three campuses (Tampa, St. Petersburg, and Sarasota-Manatee) were among the major accomplishments that warranted the establishment of a reinvigorated brand that could tell the Bulls’ story. 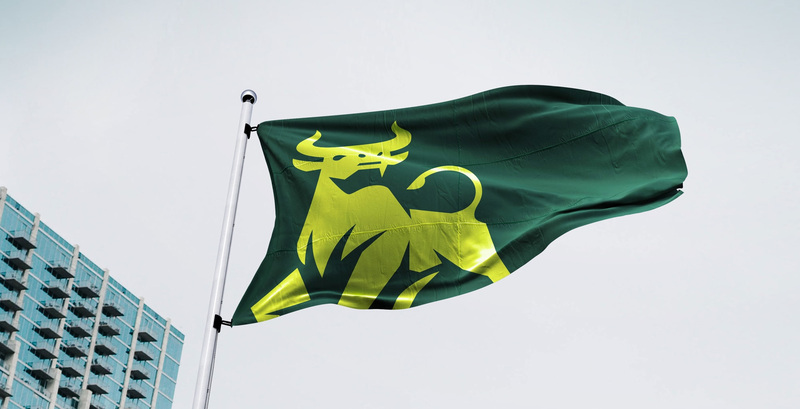 The redesigned bull logo symbolizes the university’s collective power and drive to shape the future. Within its head, you’ll find the iconic Bull “U,” and throughout its body, nods to the iconic bull statues found on each campus. 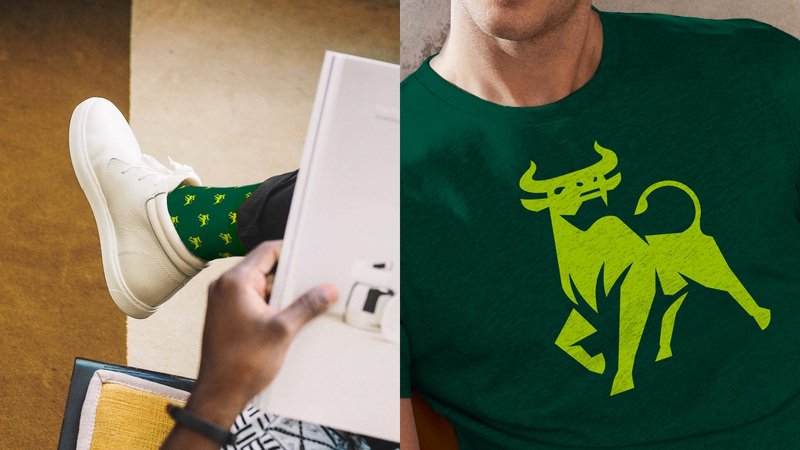 This mark gives USF academics a singular, powerful brand that can be adapted to the university’s evolving needs, while the Bull “U” logo will continue to serve as the mark for USF athletics. Explanation. The “Bull U” refers to the university’s athletics logo (which will remain unchanged). The old logo was lame, forgettable, and generic, so not much was lost in terms of history or significance. The new logo builds on the the university’s nickname, Bulls — a bull mascot has been used since 1962 — and the many bull sculptures found on the campuses. The bull drawing is strong, dynamic, and… chiseled. The hard shadows make it quite dramatic and achieve a great sense of dimension. Because of associations to finance, the logo does feel a little bank-ish but that can be overcome with time and the association of this particular bull to USF. The wordmark is a nicely customized version of Schick Toikka’s Chap — which, coincidentally, I had been using non-stop for the recent Brand New Conference — with some well-done notches that echo the shadows of the bull. They did a great job in solving the shadow on the “F”. I really like both the bull icon and the wordmark, on their own and together. Bonus points for a proper negative (or well positive) version that keeps the shadows dark; the primary version is a lot better but it’s nice that some thought went into making a proper inverse drawing. The logo system works great with the use of Chap light and the contrasting Trade Gothic (which I hadn’t seen used in a while). Part of what makes the system work so well is the great color combination of dark green, bright green, and a tan color that came from the old logo. It allows for clear hierarchy and a balanced presence. There is not much in terms of applications given that roll-out is going to happen over the next three or four months but the few things that are shown have a good energy and excitement to them that is usually missing from university identities. The combination of Chap and Trade Gothic yields some interesting compositions and the spray paint effect adds some great texture — if you consider that this is a 50,000-student state university, the fact that they are going with something as “edgy” as spray paint is quite commendable, where a conservative approach would have more easily persevered in other universities. This is the most enthused I’ve been by a university rebrand in some time and that’s even without seeing many applications. I also wonder if this new bull will eventually replace the bland-by-comparison athletics logo because it’s usually the other way around where the academics logo is the boring one. Overall, I think there is a great starting foundation for this identity in the bull icon and the unexpected typographic choices — let’s hear it for good, old-fashioned fonts straight out of the box instead of another custom sans! — as well as the cool combination of greens that provide an instant sense of vibrancy and give the university a strong and unique color palette. Thanks to Andrew Grywalski for the tip.